Sailfish brings and fosters innovation to offer unique differentiation and a competitive advantage for OEMs and ODMs, chipset providers, operators, application developers and retailers. 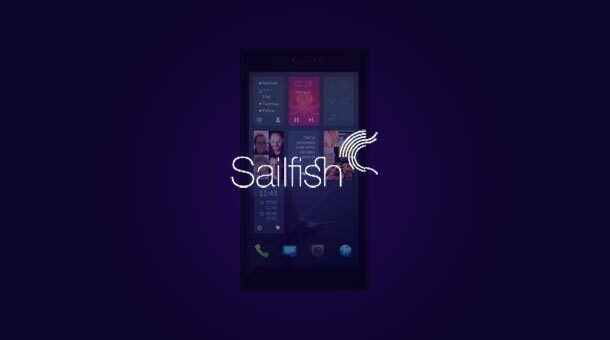 Sailfish OS is set out to be a real alternative. It is independent open, partner friendly, and created by a team with credible track record, now working at Jolla Ltd. Jolla is set to create an ecosystem unlike others around Sailfish OS and welcomes everyone to join the voyage. One of the pillar technologies used by the Sailfish OS is the Qt application framework, an incredibly powerful cross-platform set of libraries for writing complex, user centric applications. The Qt framework gives the Sailfish OS a powerful user experience design language known as QML. The QML language and features give Sailfish OS the ability to provide a rich set of UI elements, to create animated, touch-enabled UIs and lightweight applications. Jolla has developed a signature UI style using this and created building blocks for you to build your own applications with custom components named Sailfish Silica. For the best user experience and seamless native performance, applications built with Sailfish Silica Qt Quick components will be able to harness the full power of the devices running Sailfish OS. Sailfish OS includes the capability to run Android™ applications through a third party solution. It is based on open source Android libraries, ensuring performance comparable to the native environment. 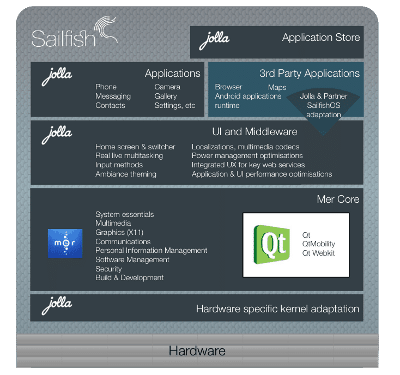 When Qt5 and Wayland technology are introduced to Sailfish OS, existing hardware adaptations made for Android can be leveraged, significantly easing the hardware adaptation work required to support the Sailfish OS. Sailfish is built on the heritage of the proven MeeGo™ technology. This ensures that core cellular functionalities like power management and connectivity are inbuilt and optimized in restrained embedded environments. The core of the OS comes from the Mer Project. The UI is built with QML and Qt Quick. This enables fast and easy customization of the UI and further development of partner specific screens with fast and easy to use development tools.